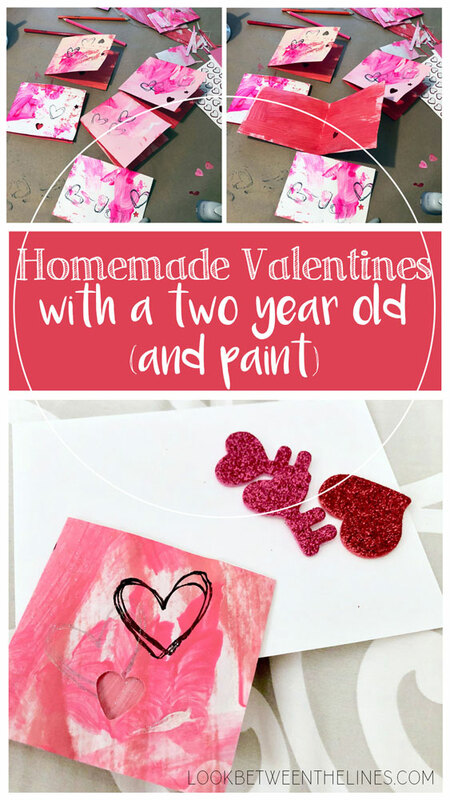 I love DIY and craft projects and am always in the look out for my next weekend project. 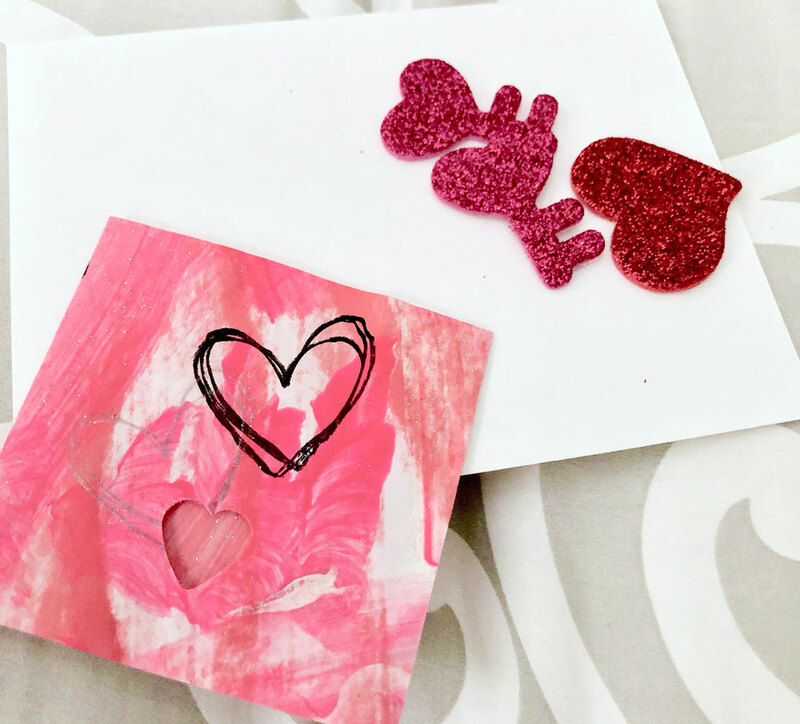 Here I share my recent home improvement endeavors, DIY decorations for showers and parties, as well as the artsy things I come up with to try and entertain my kids. Living in 1400 square feet with a family of four, plus two dogs, has encouraged me to be creative with our space. Over the years I have found new ways to maximize our space and keep our home updated. 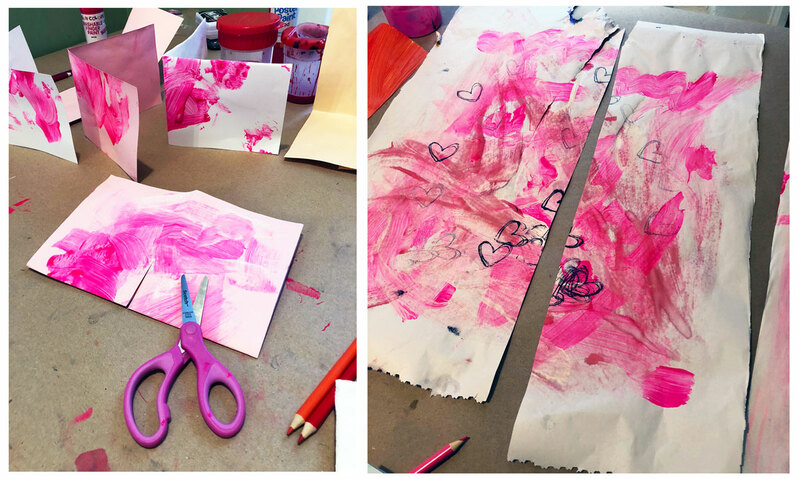 In addition to my side job as DIY home improver, I am also an art teacher and mom. 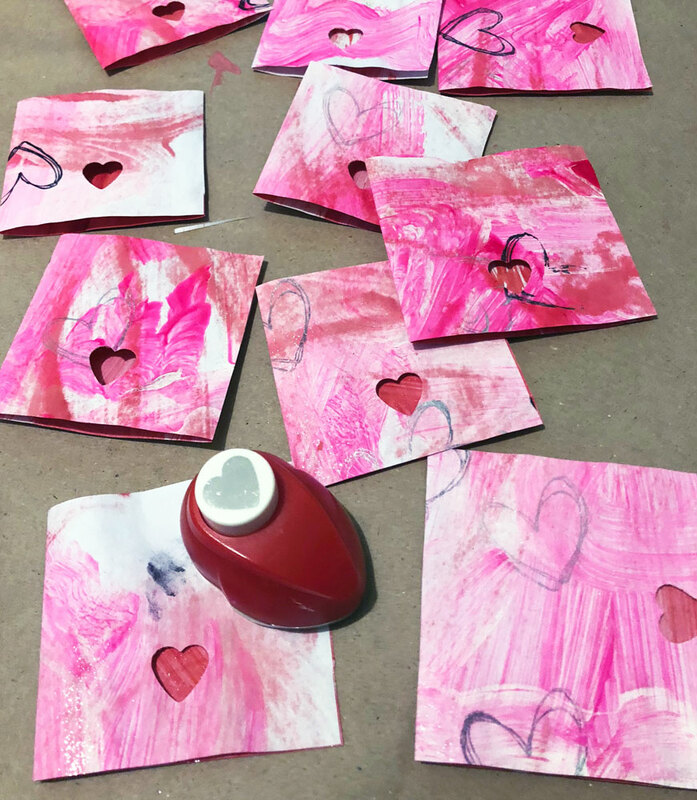 I often take the projects I teach in my high school classroom, and make adjustments for in home projects to encourage creativity and play in my kids. My art teacher background also spills over when I plan shower, birthday parties, and other events. With two siblings and five sibling-in-laws we have had a number of bridal and baby showers over the years. I can’t host one of these events without throwing in my own DIY spin on things. Read about these topics in the posts below. Do you have a great project you would like to share? E-mail me at [email protected] about teaming up for a guest post. 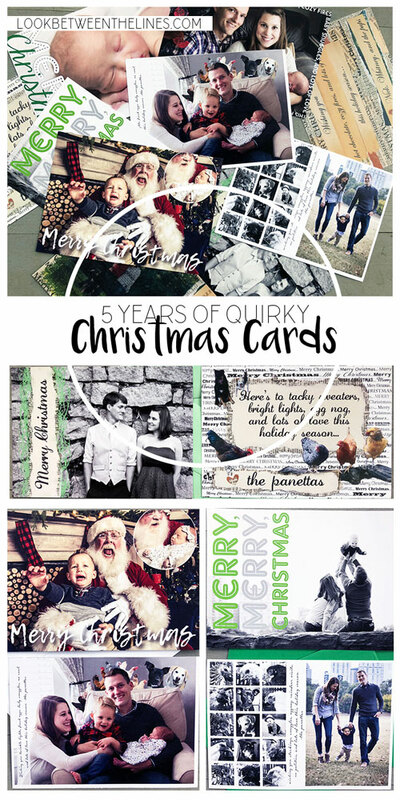 FIve years of Christmas cards. For the past five years I have been making my own Christmas cards to send out to family and friends. I enjoy putting my own spin on the traditional and I didn’t want to fall into the cookie cutter family photo and generic message that I found time and time again while perusing templates online. As the years have passed my cards have become more quirky and silly. 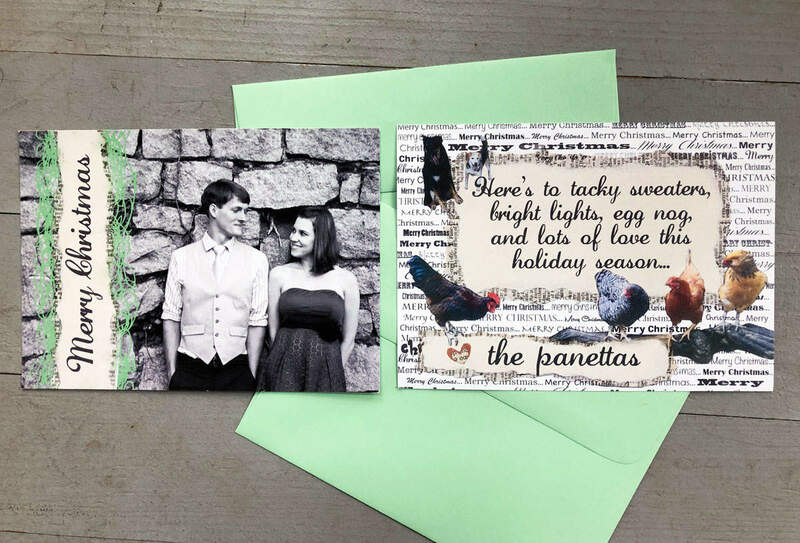 Every year I look forward to compiling images into a new card design and every year I make sure to include the entire family, chickens and all. 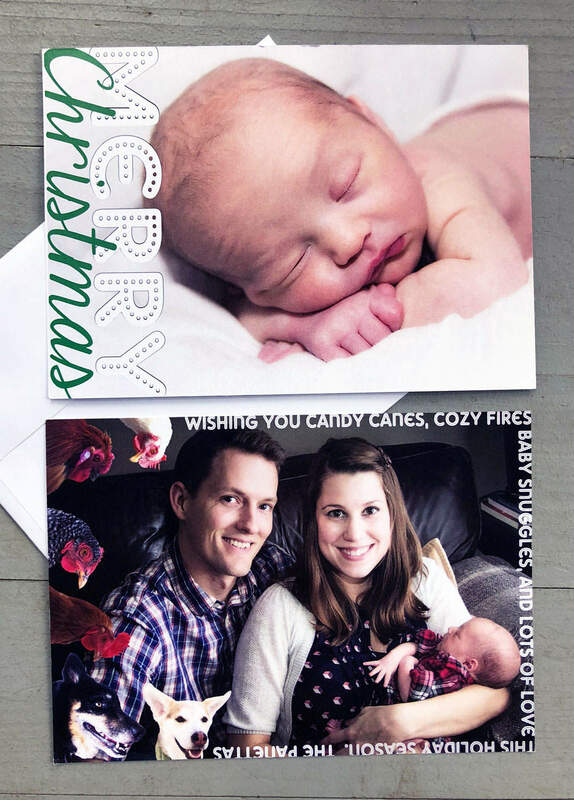 The very first year I sent Christmas cards out was in 2013. Nick and I had been married two and a half years and I decided it was time to start a new Christmas tradition. My very first card was my most complicated, I made everything by hand then scanned the completed card into the computer before sending it off to be printed. For the base, I collaged old book pages on a 8.5″X11″ sheet of paper. 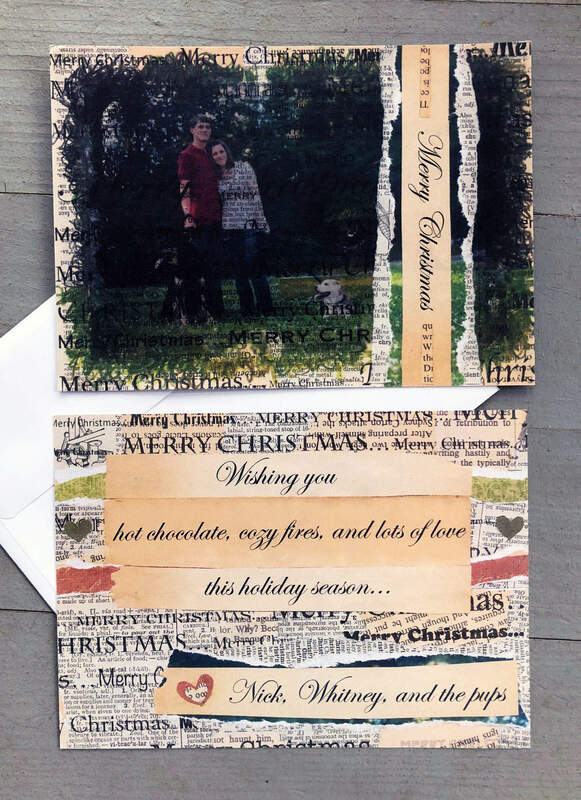 I then printed the words “Merry Christmas” in different fonts onto the collaged paper. Next, I ripped it up and layered it on card stock cut to the size of a postcard. 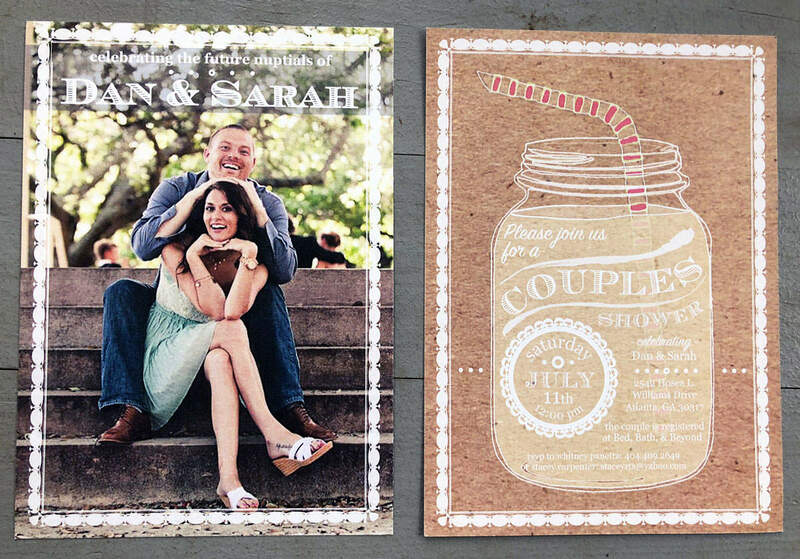 I then printed one of our engagement pictures on a laster printer, and created a Mod Podge transfer of the image. 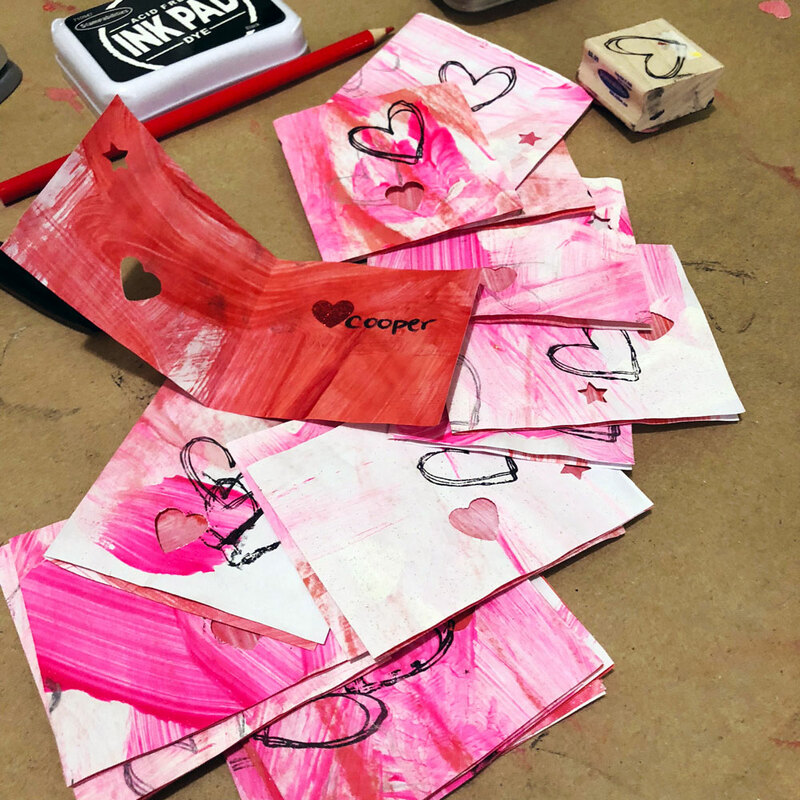 Read the specifics on how to create Mod Podge image transfers here. I wanted the edges of the image to blend into the background, so I matched the color in the picture with colored pencils and scribbled on the edge of the image to blend it out. 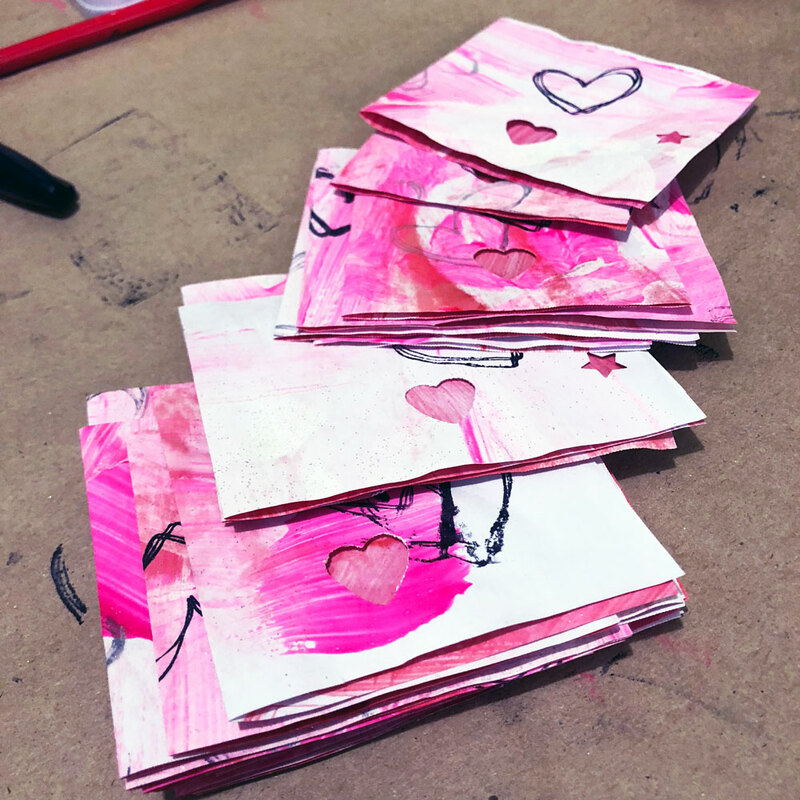 I then layered ripped up book pages, pieces of the printed image, and discolored paper on the right side of the front to create a space to put text. I did the same on the back of the card to create another space for text. Once the collage was done, I scanned it into the computer. I then used Photoshop to add the words on the front and back. When my creation was finally complete, I sent them off to a local printer and had them printed out postcard style, with the image on the front and back. 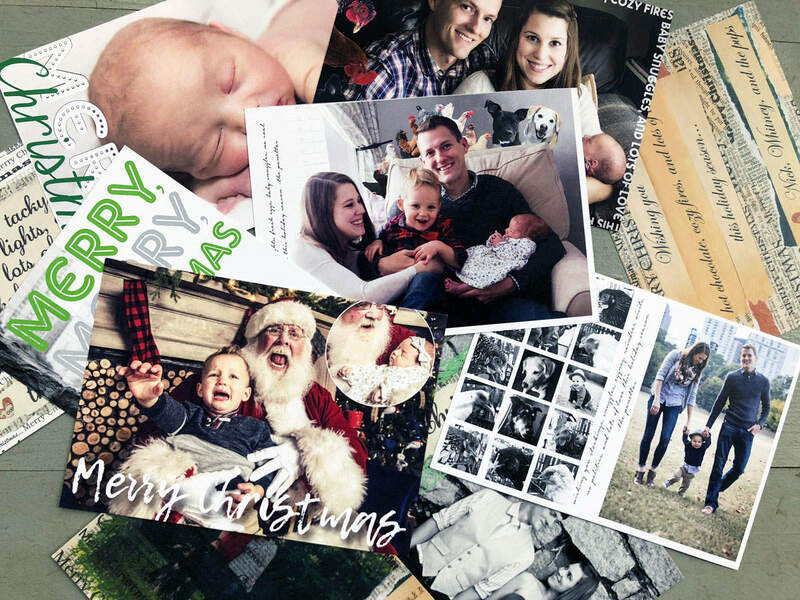 For Christmas 2014, I did more digital editing on the front of the card, while I kept the collaged look on the back. 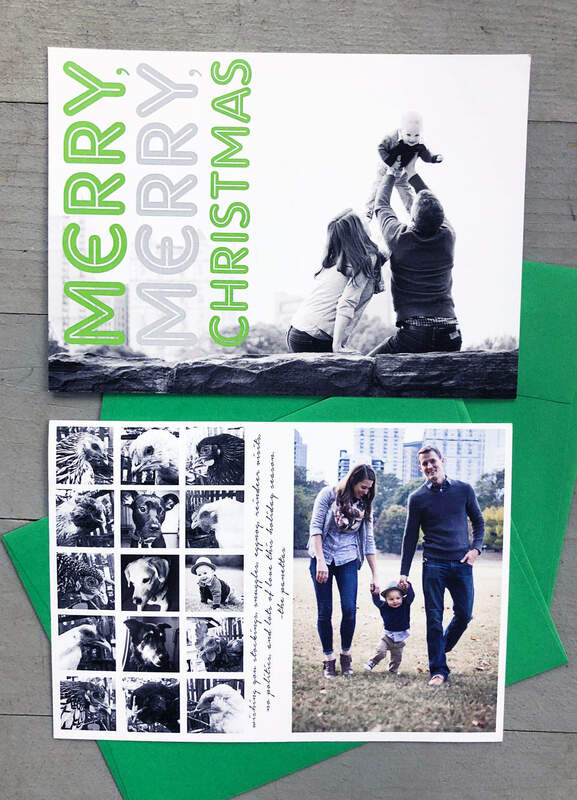 For the back, I once again printed a sheet of paper that had “Merry Christmas” repeated. I glued this to a postcard size base. I then ripped up book pages and off-white paper to create a space for text. Next, I cut out pictures of our two puppies and 4 chickens, a new addition to our household. I glued the cut out images to the back then scanned the image into the computer. Once the image was scanned in, I used Photoshop to add the text. For the front of the card I used another picture from our engagement photo session. I added the green scribbles using the paintbrush tool in Photoshop. I then scanned in a strip of ripped up book pages with a strip of off-white paper glued on top. I took the image, removed the background, and layered it on top of the green scribbles. I then added the text on top. Once Christmas 2015 rolled around I decided it was time to move away from the book page collage look and try something new. Both the back and front were completely done using Photoshop. For the front I simply added text on top of a picture of our newborn son, Cooper. For the back I added text around one edge of our family photograph. I added pictures of our chickens and puppies on the right side, to help balance out the text. For the animal pictures, I used a magnetic lasso to cut them out, then removed the background. If you save a file as a .png, it will keep the background transparent when you add it to another file. It took awhile for me to cut out each animal head, but the end result was worth the time. Once the images were complete, I send them off to my local printer. I did have an issue with the text being cut off, a hard lesson to learn. For future cards I tried not to put the text so close to the edge. The Christmas 2016 card is still my favorite to date. I love the simple, yet quirky look. Like my 2015 card, I layered text on top of a picture in Photoshop. For the back, I cropped pictures of all our chickens, dogs, and Cooper to squares and converted them to black and white images. It ended up being the perfect number to fill the space. Our little family grew between 2015 and 2016 from 4 chickens to 11, 2 dogs to 3, while our child count stayed at one. With so many new members of our family to include, it was a bit of a puzzle to work it out. On the right side of the card I included another human only family picture. There was just enough space between the two sections of pictures to include the text. 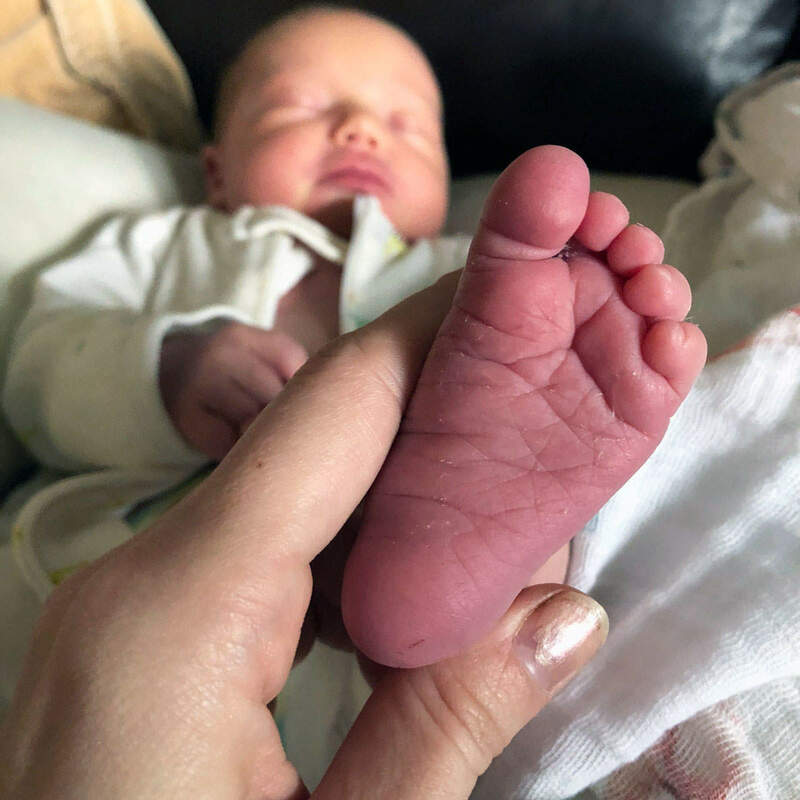 This year, our family once again grew with the addition of baby girl Kennedy. I love this card mainly because of the amazing Santa picture, thanks to Jeff Roffman. I wanted a picture with Kennedy, Cooper, and Santa on the front, but the picture of Cooper and Santa was too priceless to not include it. I opted to make it the main picture, and added a smaller circle cropped image of sweet Kennedy snoozing with Santa. Needless today, neither child told Santa what they wanted this year. The circle picture and text were both added using Photoshop. On the back I once again ventured into the world of picture cut outs. I once again used the magnetic lasso tool in Photoshop to remove the background of pictures of all our chickens and pups. I wanted it to look like they were sitting behind Nick, so I layered one version of our family photo in the background, added the animals, then layered another family picture on top, with the background cut out where the animals were placed. I then added a transparent white rectangle on the left and layered text on top. In addition to Christmas cards, I have also designed my own birthday and shower invitations. 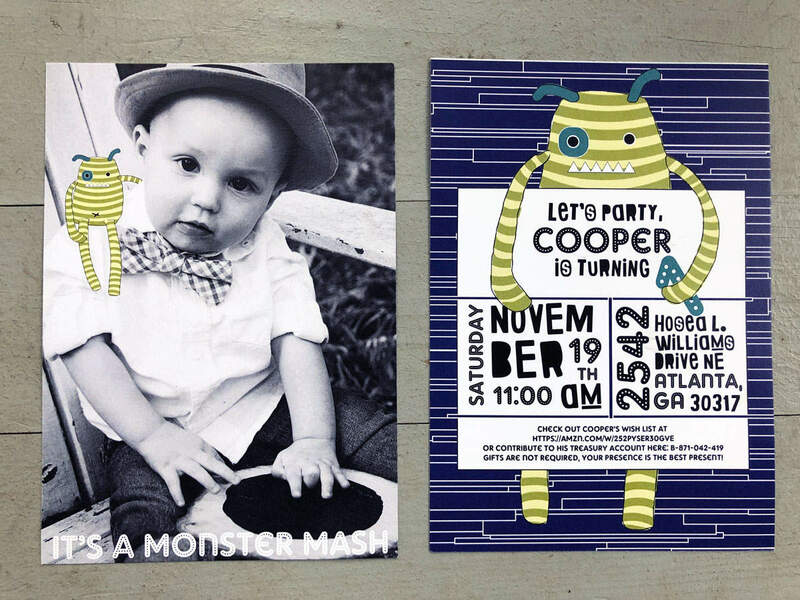 I have plans to create a post about all the crafts I did for Cooper’s first birthday. Be on the look out for that in the near future. The bottom image is a shower invitation I designed for my brother and sister-in-law. I created blog posts about a fabric tassel and personalized photo banners I made to decorate for their shower. Merry Christmas and happy holidays! 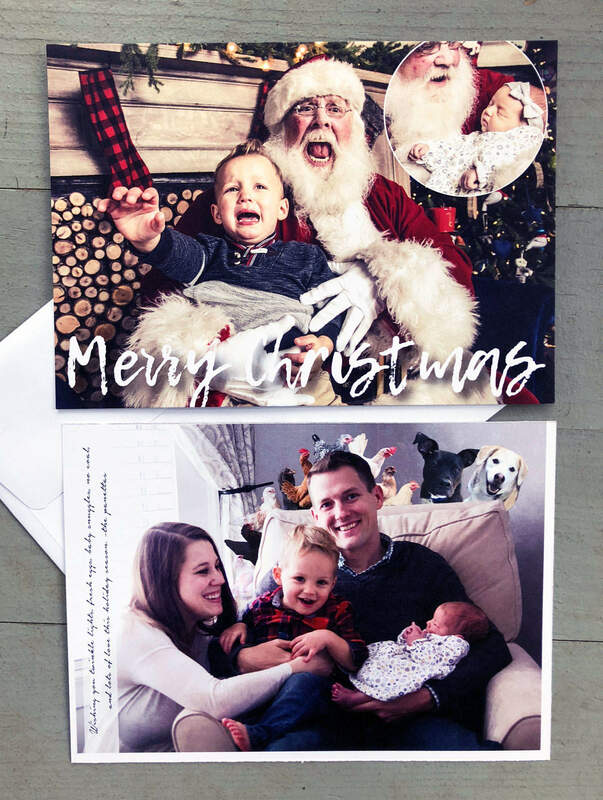 Thanks for checking out my blog post about my annual Christmas cards. Help me spread the word about Christmas crafts by sharing on your social media site of choice. Thanks for stopping by! 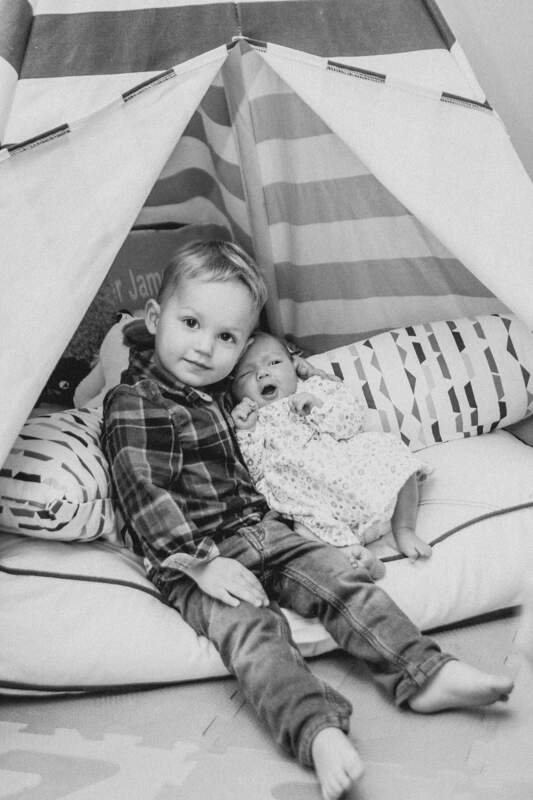 We welcomed baby number two, sweet Kennedy Elise, into our family on November 21st, 2017. Cooper was born almost exactly two years prior, on November 12th, 2015. After Cooper’s arrival, I realized I needed to get a “baby’s first Christmas” ornament for him. After a great deal of research and browsing, I came up empty handed. All of the ornaments I found were either too cheesy, too frilly, or too cookie cutter. I decided that rather than buying something pre-made, I needed to put my craftiness to use and make my own. 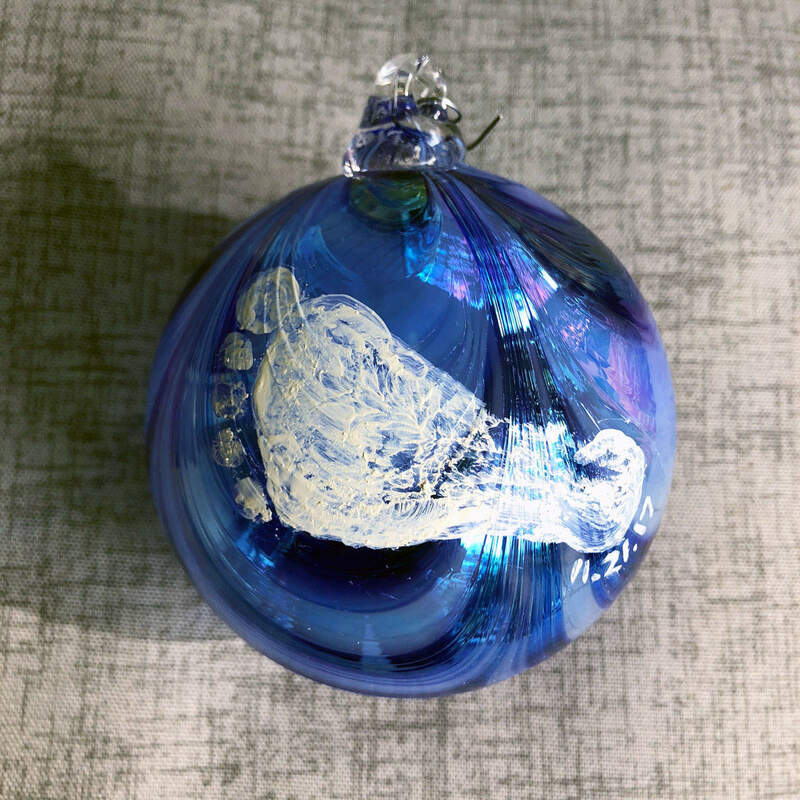 I found a beautiful, handmade glass blown ornament from an Etsy seller, which was much more my style than anything I had seen up to that point. 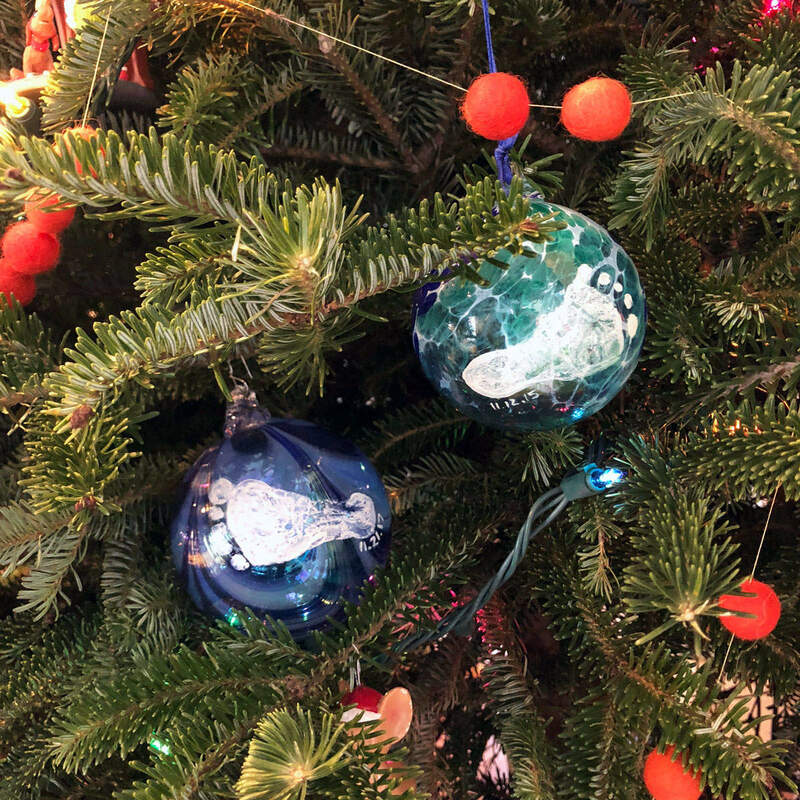 Once the ornament arrived, I painted Cooper’s foot, pressed it to the ornament, and wrote the date. In less than five minutes (not including baking time to set the paint) his personalized ornament was complete. I blogged about the process here. When Kennedy was born, I decided it was time to plan for her ornament as well. I found another amazing Etsy seller and purchased this glass ornament from Oregon. I didn’t want the standard pink just because she was a girl, and instead purchased this beautiful iridescent ornament. 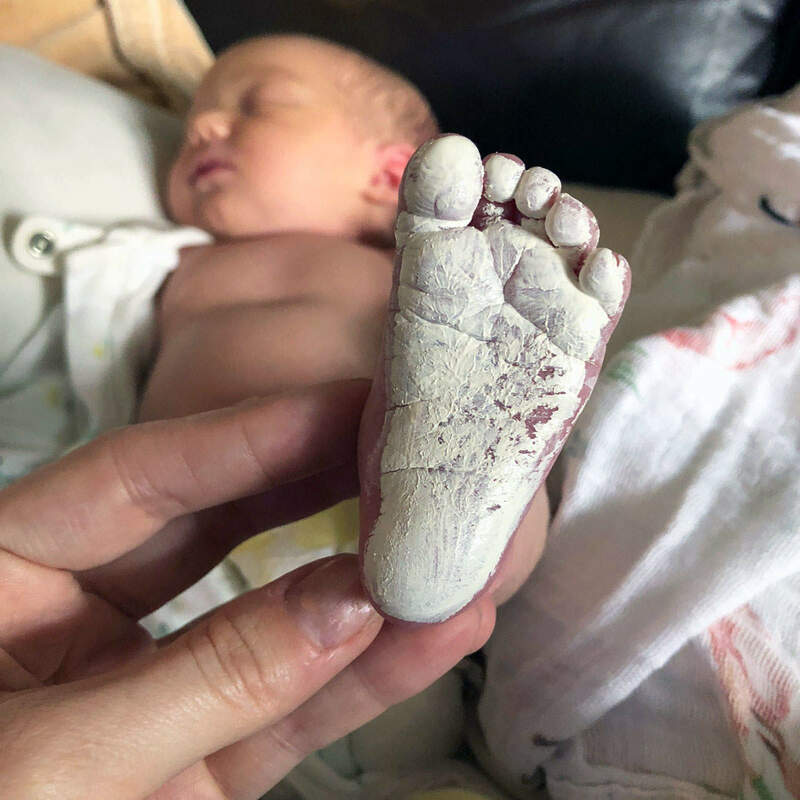 Once it arrived, I collected my other supplies: white paint (choose a type that sets on glass when baked in the oven), a medium sized paintbrush, a thin paintbrush, and a baby foot. Wait for your sweet angel baby to fall into a deep slumber. 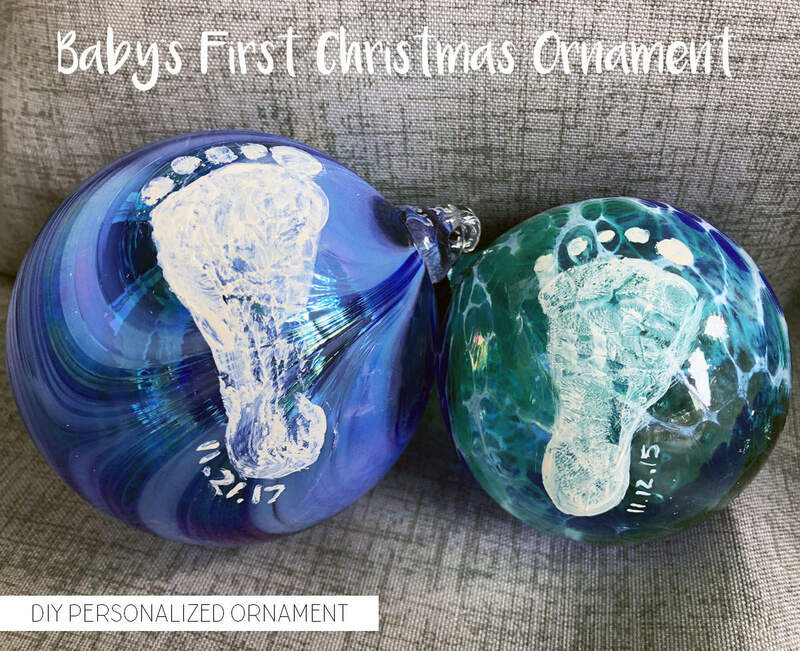 Paint the bottom of the foot using the medium size paintbrush and quickly press it to the ornament. Clean up any smears, etc. and add the birthday using the thin paintbrush. 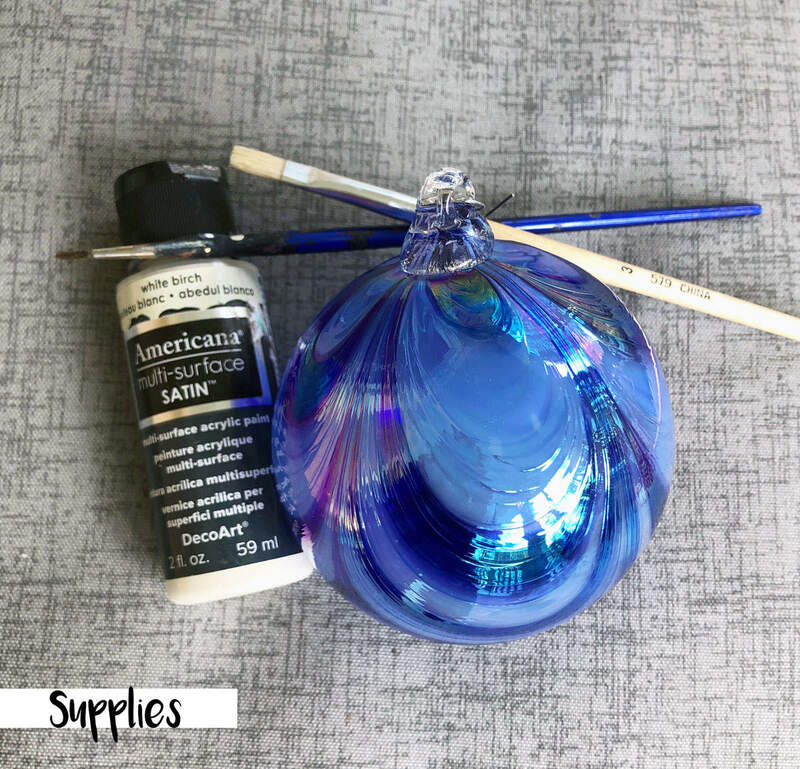 Follow the instructions on your paint bottle on how to set the paint on the glass surface. 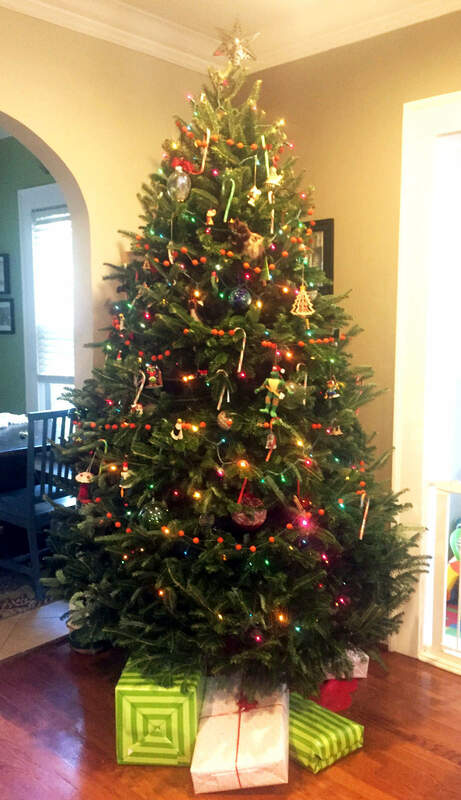 Hang your ornament and enjoy! Get those sweet baby snuggles. Thanks for taking the time to check out my blog! Help me spread the word about craft projects, Christmas cheer, and all things artsy by sharing with others. Thanks for stopping by! 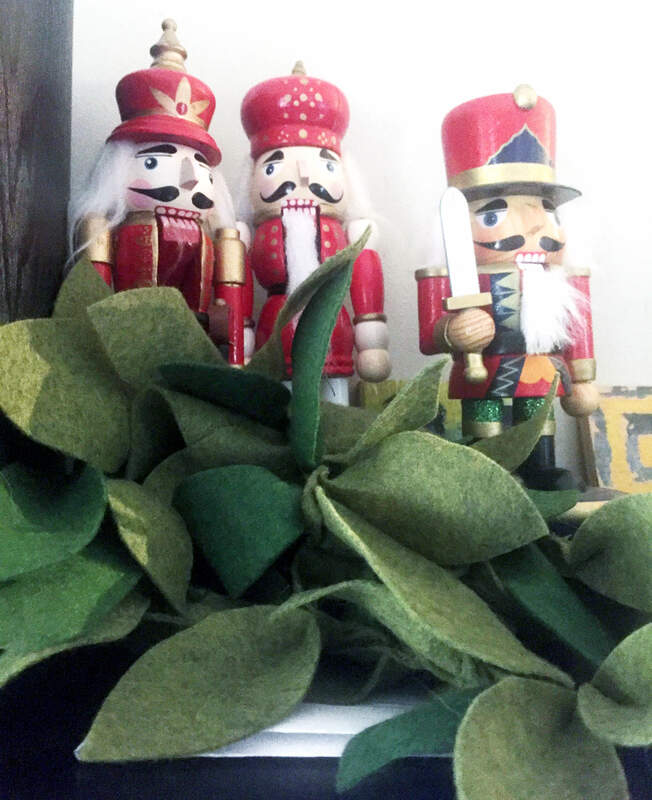 There is nothing I love more than a holiday craft project, and every year I look for a new craft project to add to my Christmas decor collection. 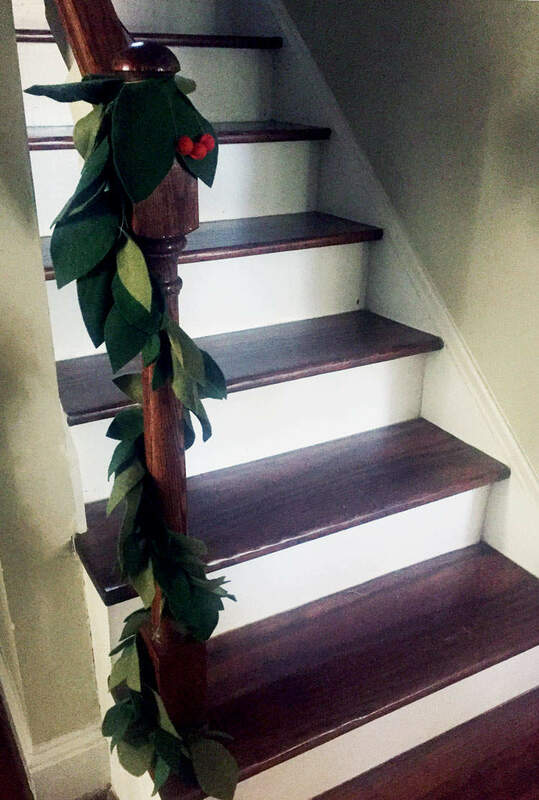 After pulling out my hand me down fake greenery garland from the mid 1990’s, I decided it was time for an upgrade. A do it yourself Christmas garland was bumped to the top of my craft to do list. I love the look of crafty and homemade (while still looking well made) decoration. For me, felt embodies that look. 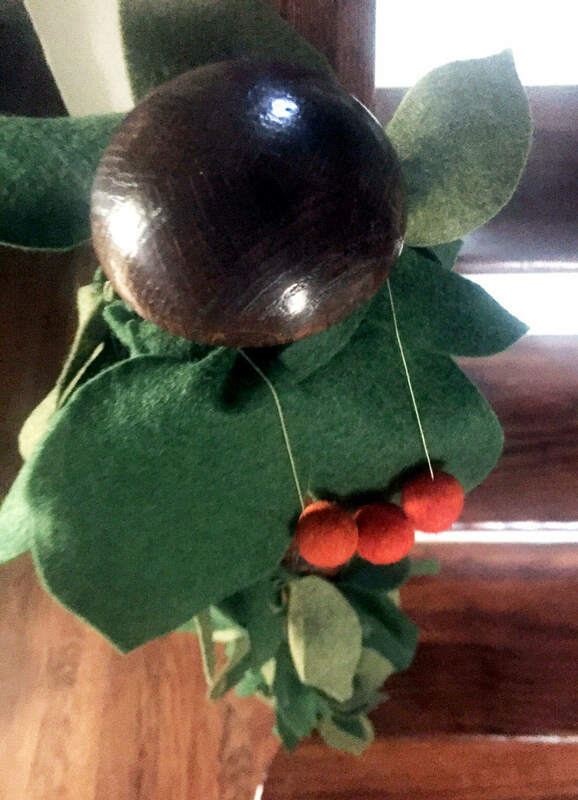 For both my greenery garland and ball garland, I selected felt as the base material. 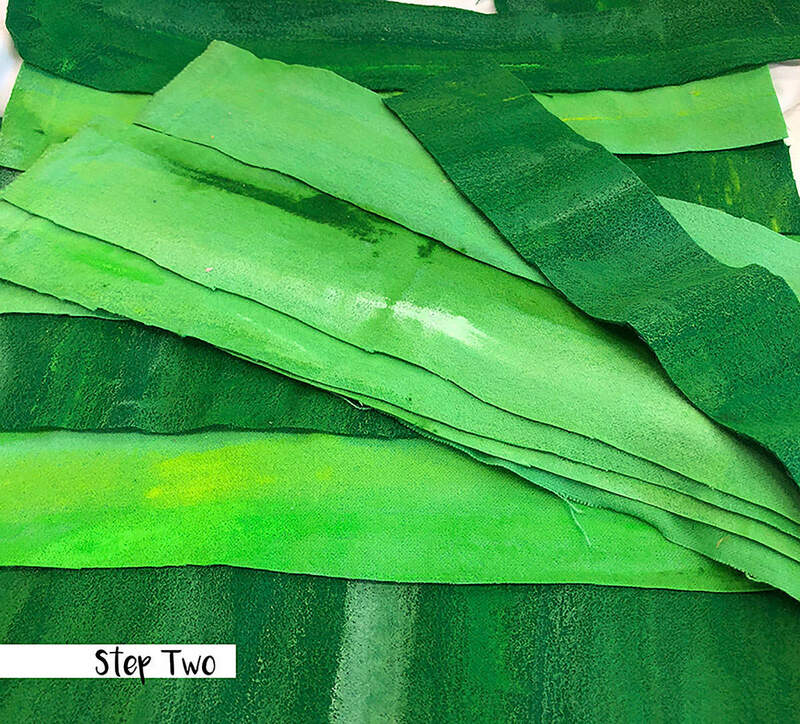 STEP ONE: Cut strips of the felt into 1/2″ wide sections. The length doesn’t matter, although you want it as long as possible to save time connecting pieces together. 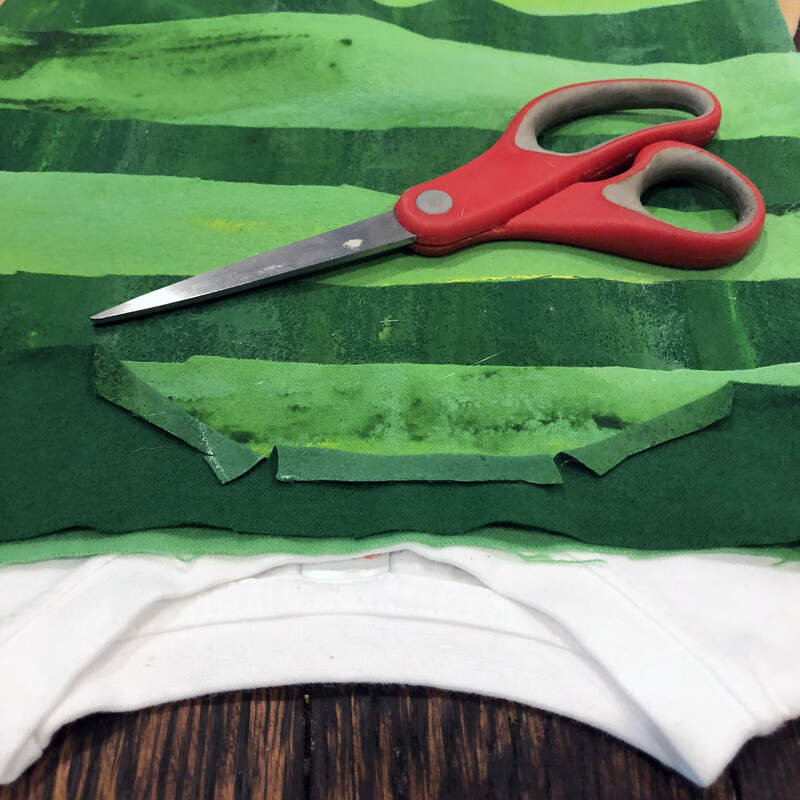 The strips of fabric will serve as the base to connect the felt leaves to, to create the garland. Select one color felt to use as the base, or alternate between the two colors. 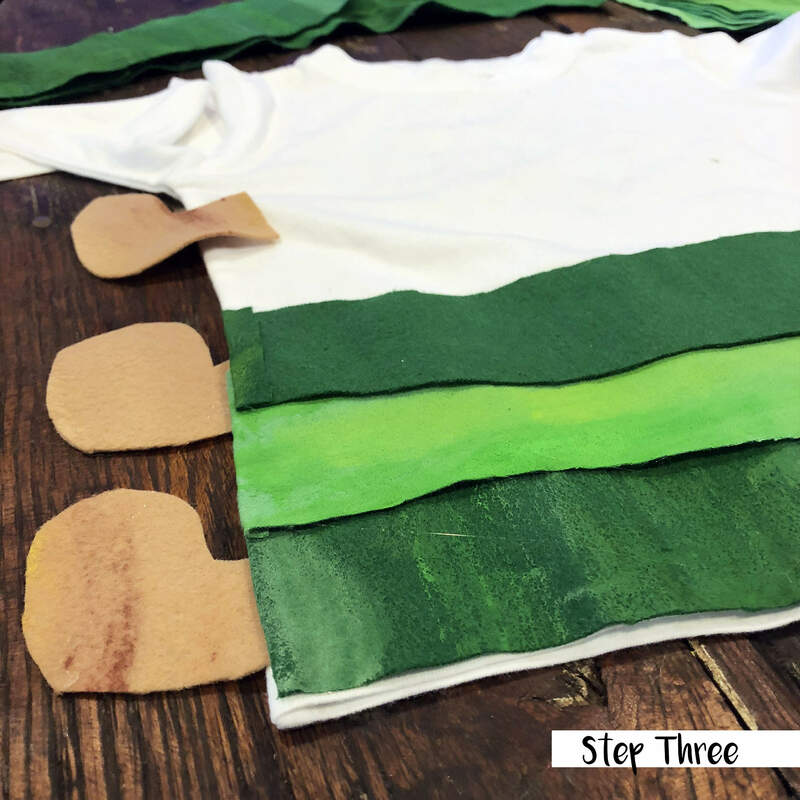 STEP TWO: Connect the ends of your 1/2″ strips together to create one long piece. 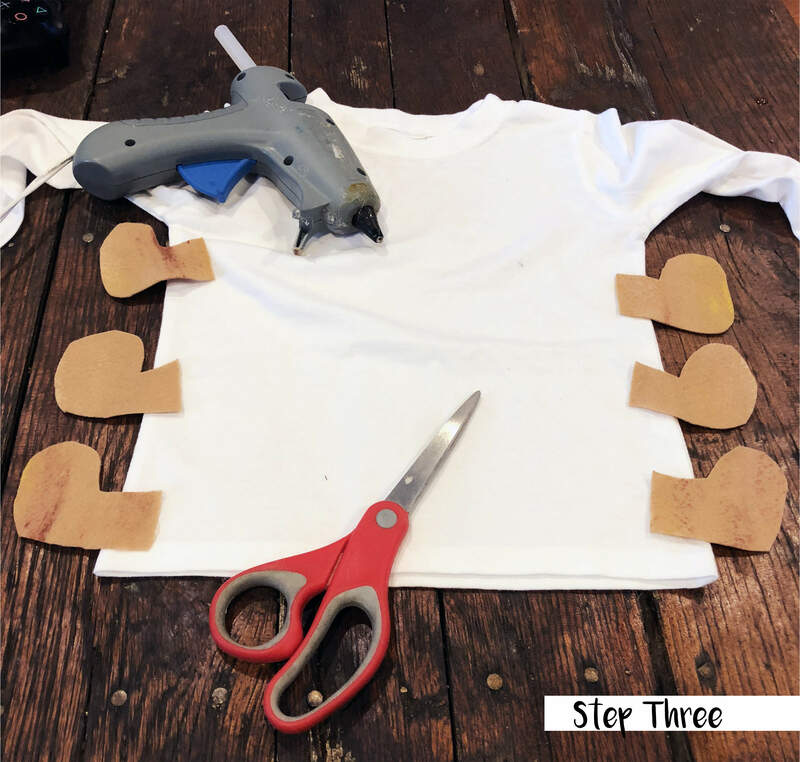 Use a sewing machine or hand sew the pieces together. The length of the garland is up to you. I created one long piece, approximately 5 feet long, and two shorter pieces, approximately 2 feet long. STEP THREE: Cut the rest of the fabric into leaf shapes, ovals with pointed ends. For my garland, I wanted larger leaves so I cut them approximately 2 inches wide, at the wides point, and 3-4 inches long. 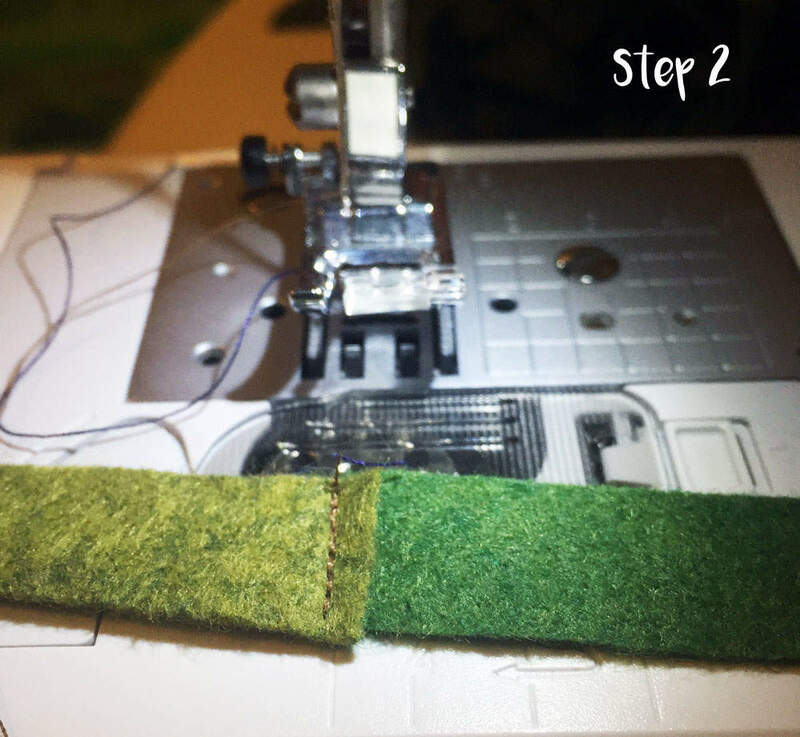 STEP FOUR: Sew the leaves onto the strip of felt. 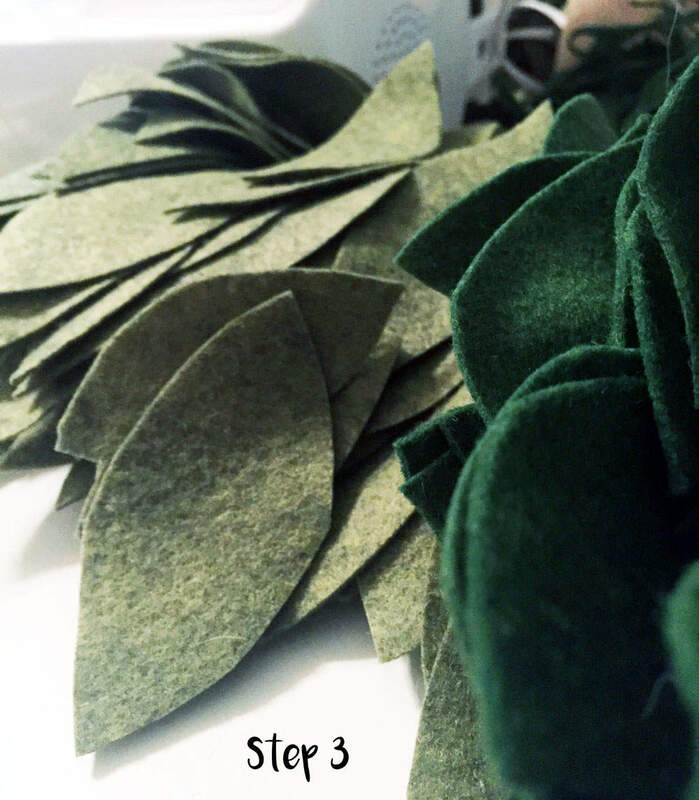 For a cleaner look, keep the leaves pointing the same direction, but alternate which side of the felt strip you connect the leaves to. 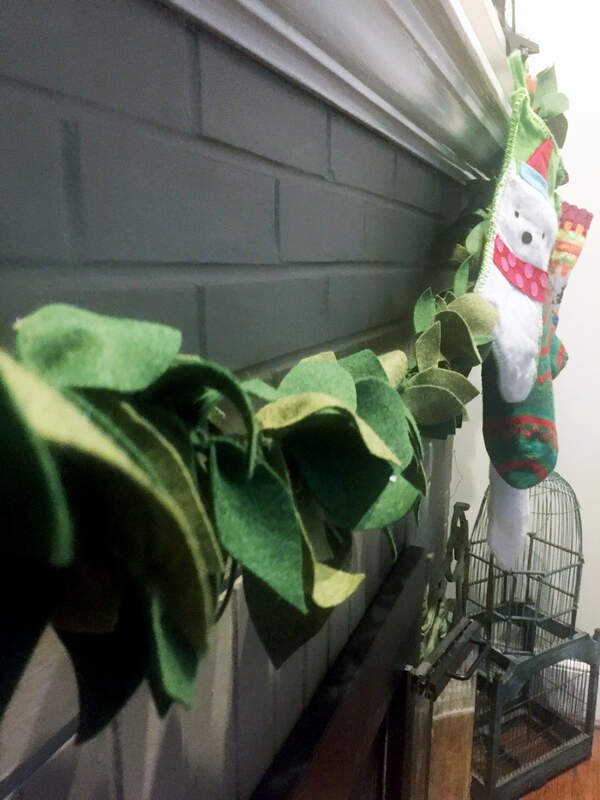 STEP FIVE: Hang your garland on your fireplace, around your bannister or place it on a shelf for an easy, festive look. 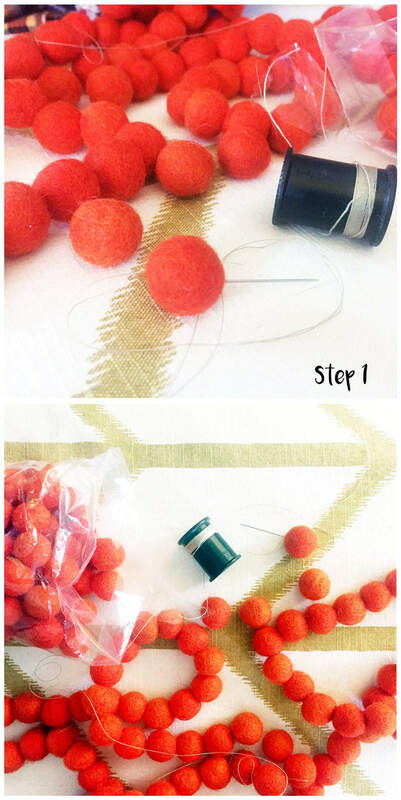 STEP ONE: Thread your needle, knot the end of the string, and string the red balls together. STEP TWO: Hang your garland! 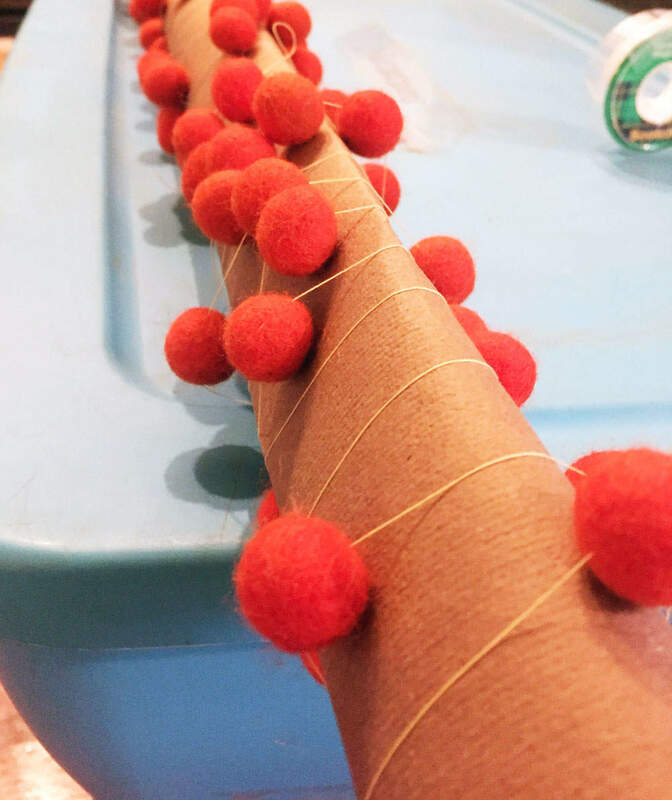 I opted to spread the red balls out along the thread in order to make it stretch further. 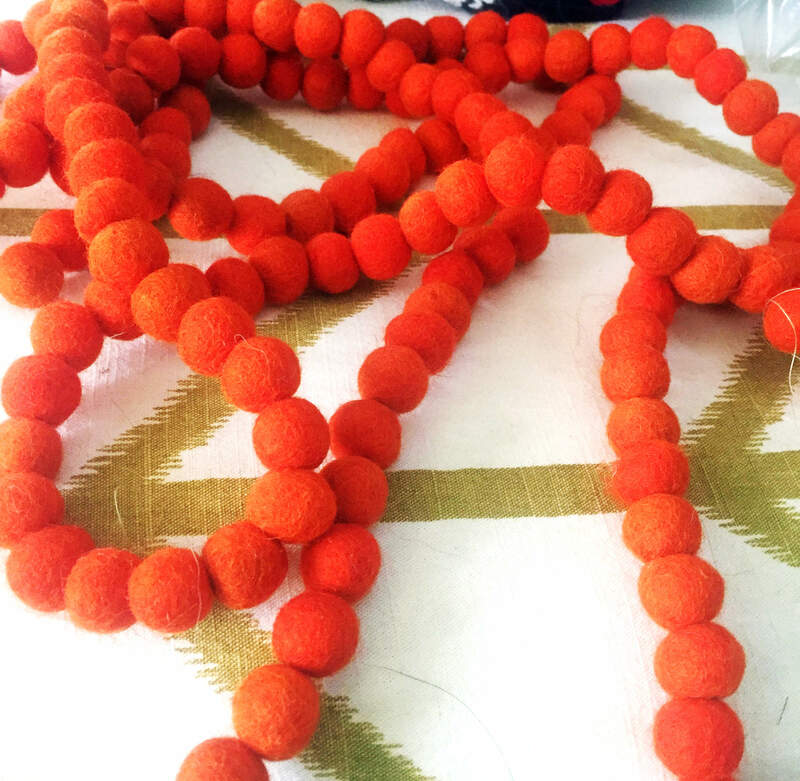 If you want a solid string, plan ahead and order enough felt balls to do that. 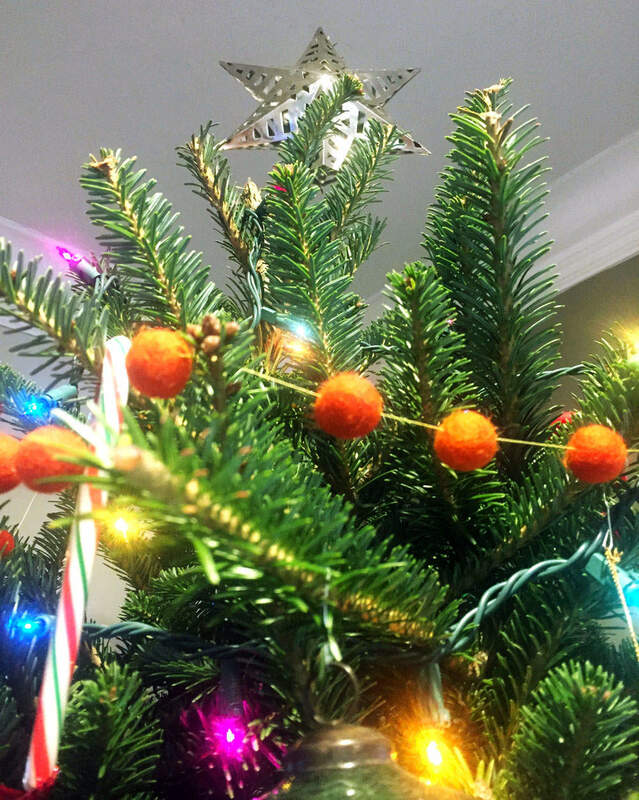 tip: To avoid a tangled garland use thicker thread, hemp, or similar to string the felt balls. Plan ahead and have a larger eye needle on hand. 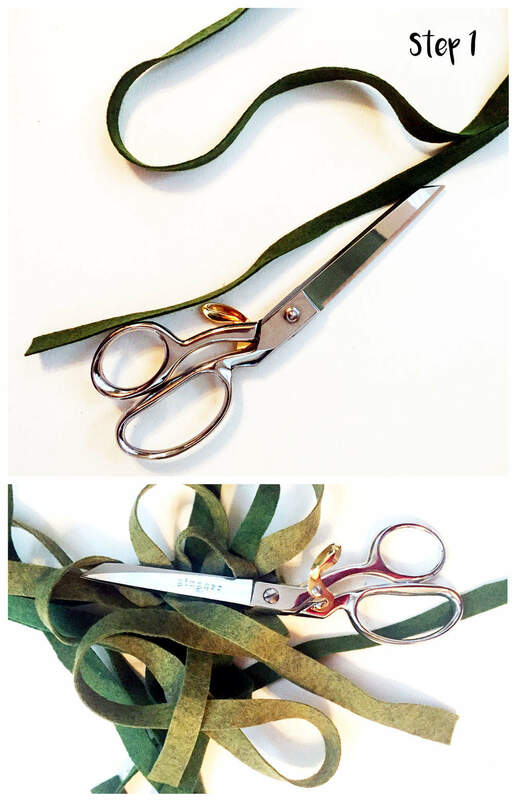 Combine the two Christmas garlands together to create a red, green, and festive look. 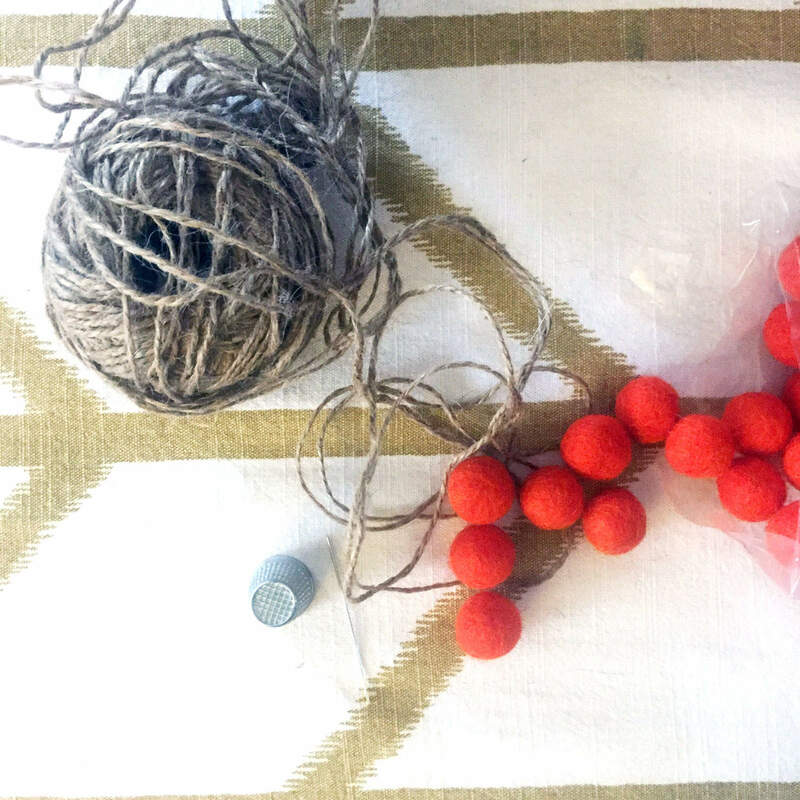 tip: for storage, wrap the red ball Christmas garland around a wrapping paper tube. Tape the ends down to keep it in place. Thanks for taking the time to check out my two DIY Christmas garland projects. I look forward to using these year after year and adding to them with future holiday crafts. Help me spread the Christmas cheer by sharing on your social media of choice. Thanks for stopping by. I am extremely lucky in my work situation. 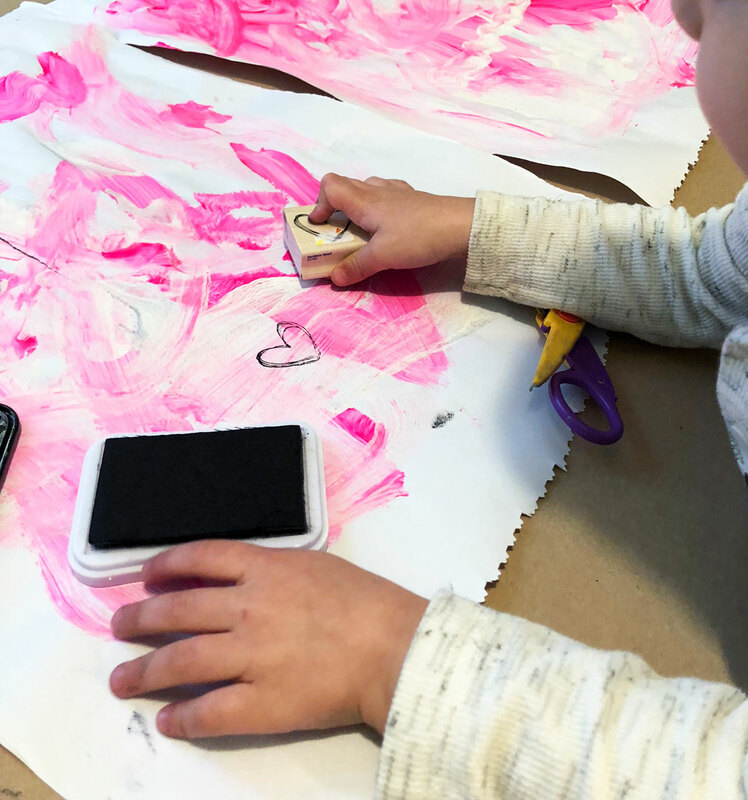 I get to do what I love, teach art full time, and bring my almost two year old to school with me everyday. My school provides on site daycare for all their employees. It’s easily half the cost of standard daycare and he is on campus with me. This opportunity has kept me working, which is what I want to do. Before kids I didn’t realize many women had to stop working due to the ridiculous cost of daycare. 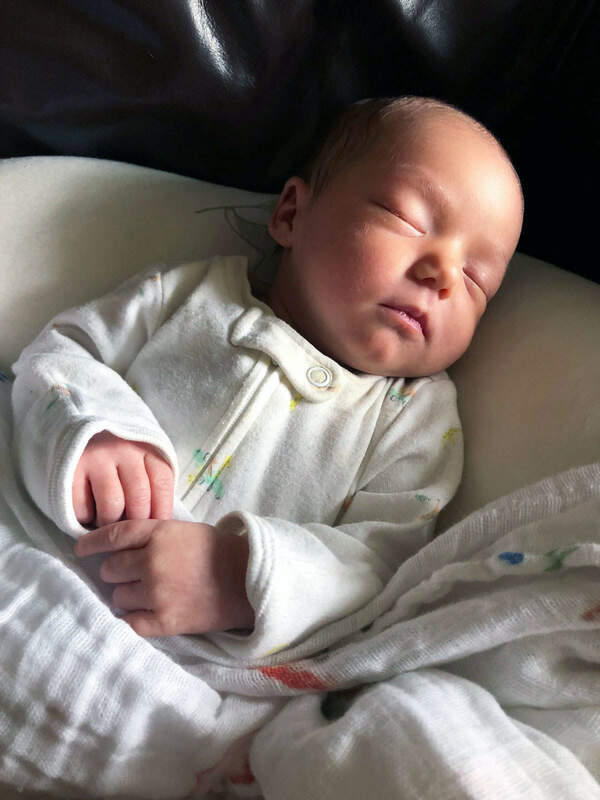 Even with baby number two on the way, we can justify the cost of full time childcare for two while I stay in the classroom. 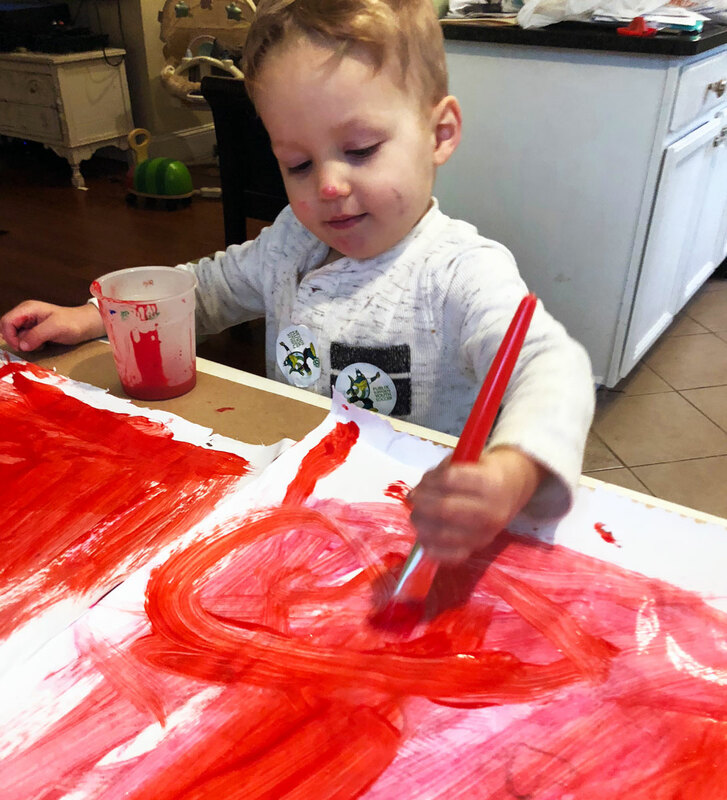 Cooper has been attending his “school” since he was four months old. We both get a nice summer off, but come August we are back at it. Although I teach high school, I work at a K-12 school. This makes daycare even better, the kids get a glimpse of life in elementary school and they get to participate in a number of their events. One such event is the annual book character parade. 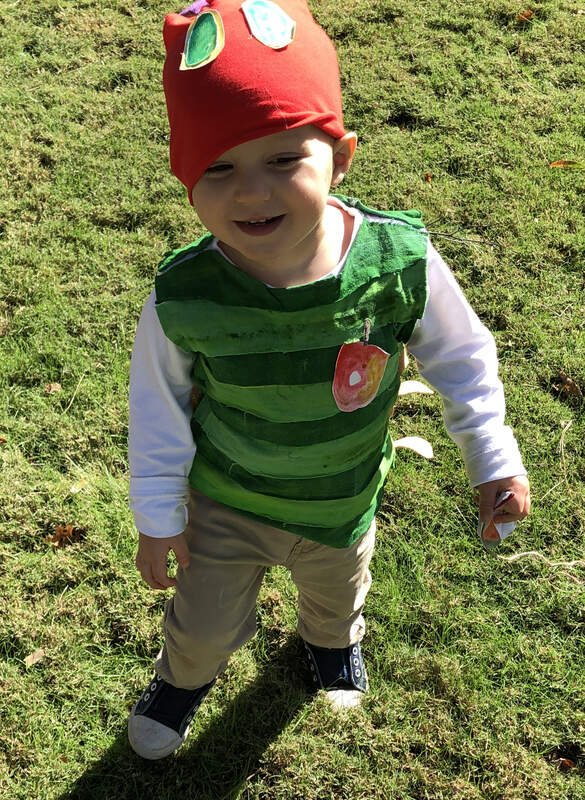 All the daycare and elementary students get to dress up as their favorite book characters and parade around the quad for their parents, middle and high school students, and faculty to see. This was the second year Cooper got to participate, and this was the second year that I waited until the night before to pull it all together. Although I put myself in a stressful situation by procrastinating, it made me realize that I love making his outfits for events like this and I can do it on a budget and tight timeline. 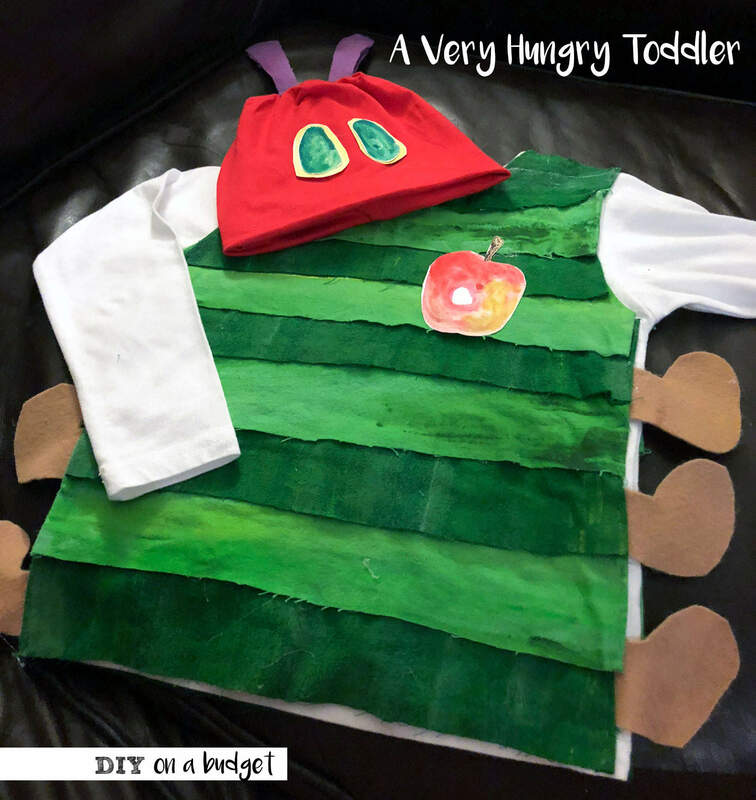 For his “The Very Hungry Caterpillar” or as I like to call it “The Very Hungry Toddler” costume I had fabric leftover from his book character the year before, the “Chicka, Chicka, Boom Boom” tree. It made the project that much easier to have most of the supplies on hand. 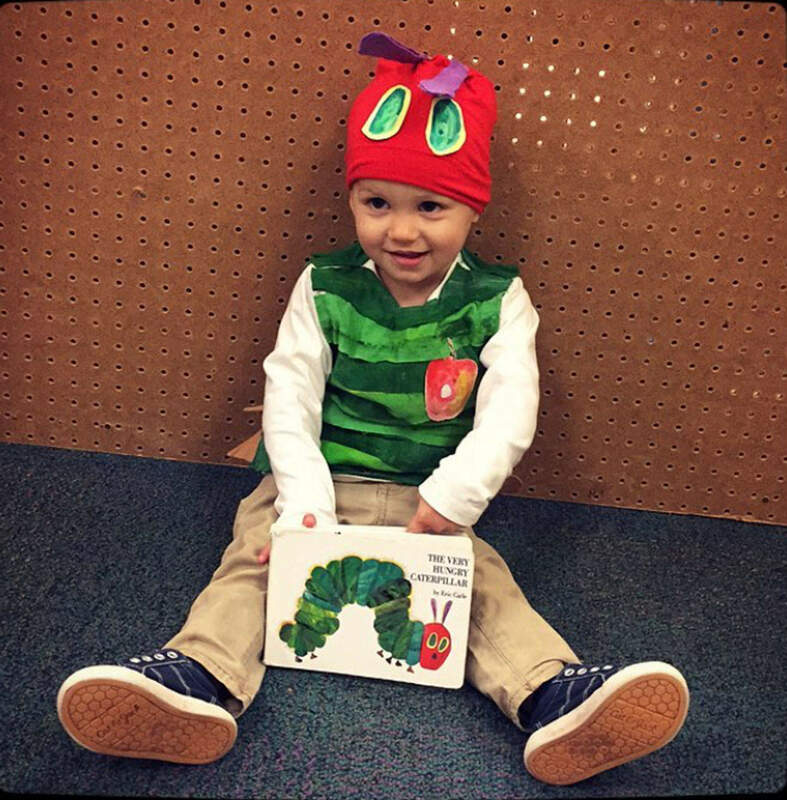 To get the Eric Carle illustration look on Cooper’s costume, I painted on top of fabric. His illustrations have a beautiful range of value in each object. You never see something one solid shade of green. Instead, you may find a range of value from yellow to yellow-green to light-green to dark-green, and even more in between. 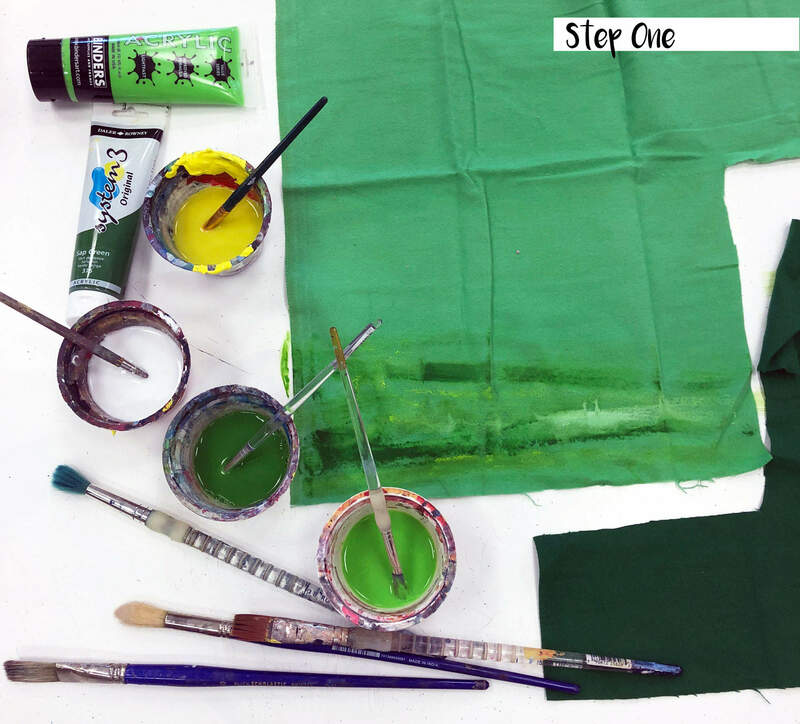 I picked two shades of green, yellow, and white paint to mix together on my green base fabric. I watered down acrylic paint, and loosely added color with big paintbrushes. I painted the fabric before cutting it up to make it easier to paint and to give it an even more Eric Carle look. I tried not to follow a stripe pattern. I randomly introduced colors, blended them together, and made a mess in general. I used the same colors on the dark green fabric. On the purple fabric, for the caterpillar feelers, I used a different shade of purple and white. On the brown fabric I used yellow, another shade of brown, and white paint. After letting the fabric dry, I started cutting everything out. I cut strips for the body of the caterpillar, round foot shapes for the feet, and long narrow pieces for the antennas. This is the type of crafty project that looks cute and crafty, so I did not worry about fraying edges or uneven cuts. In situations like these, I tell myself if everything looks a little funky it all comes together to create a beautifully funky end result. Next, I started hot gluing all the pieces to his white shirt. I started with the feet, overlapped them on the front, and glued them down. I then added the strips of green, alternating between dark and light. I wanted the sides of the stripes to look cleaner, so I folded the ends and glued them down. I then glued them directly to the shirt. I left the seam line exposed, covering the front completely, then adding the strips to the back of the shirt. This allowed the shirt to still stretch (somewhat) to put it on him. Since the parade happened mid-October, it was a little chilly outside. 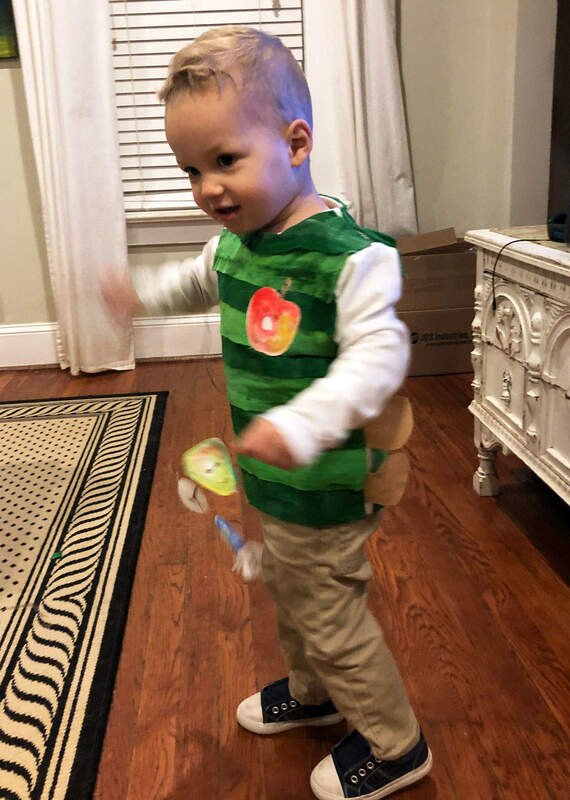 I opted for a long sleeve white shirt (bought on the cheap from Amazon), but decided to only add the green stripes to the center of the shirt. It also made it a lot less complicated not adding them around sleeves. It was tricky adding the pieces to the collar. A lesson I learned from last year’s costume is to leave the seam line on the shoulders exposed. After attaching all the leaves for the tree around his collar, there was no stretch left in the head opening. Cooper has an unusually large head, so I ended up cutting slits on either side just so we could put it on. After the shirt was complete, I moved onto the beanie. I cut out four, thin purple strips of fabric, hot glued a piece of cardboard to one, and covered it up with another piece of purple fabric. I left a little extra fabric at the bottom, so I could “pinch” it to the hat using hot glue. Next, I hot glued the eyes. You could use yellow and green construction paper, cut out ovals, and overlap them. I decided to paint them with watercolors on watercolor paper, then cut them out. I wanted to continue the painterly look of “The Very Hungry Caterpillar” illustrations. 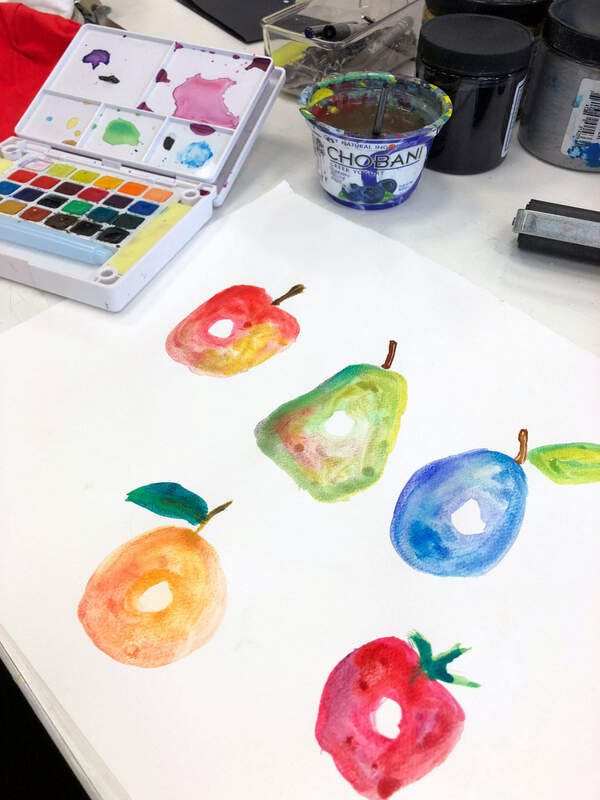 In addition to painting the eyes, I also painted a few examples of the fruit the caterpillar ate. I used watercolors, and combined multiple colors to imitate the color variation in the book. I wasn’t sure how to incorporate them into the costume, but decided to have them on hand in case an idea struck me. In the end I glued the apple to the front of his shirt and attached the rest on a string for him to carry during the parade. 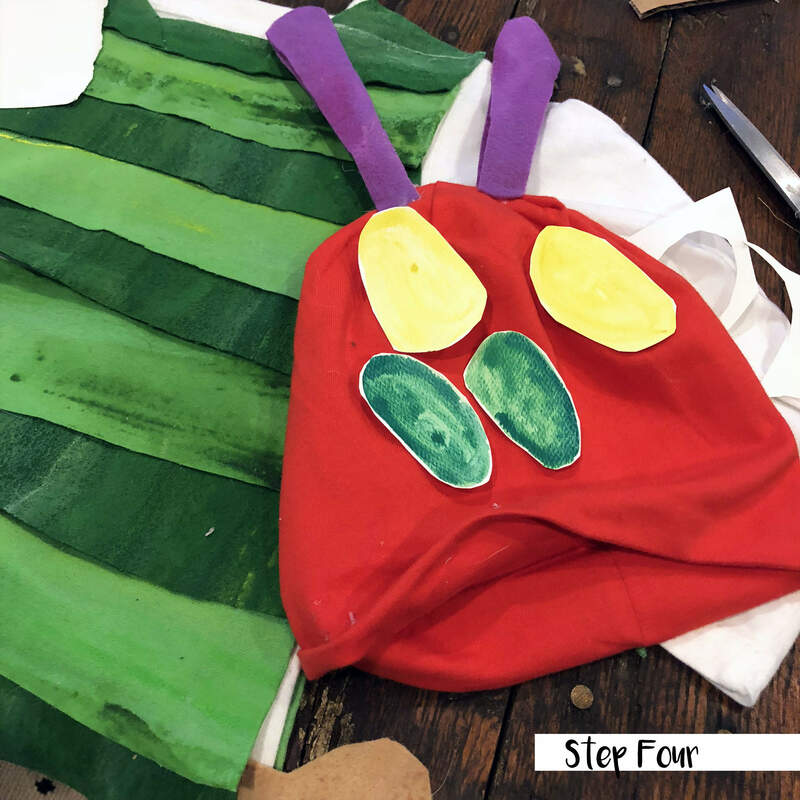 If you don’t have access to these supplies or don’t have the knowledge on how to do it you can always print pictures of the illustration and add them to the costume. He loved shaking the fruit on the string. This is the best picture I have of him holding it, and it barely lasted the day, but I loved the touch it added. 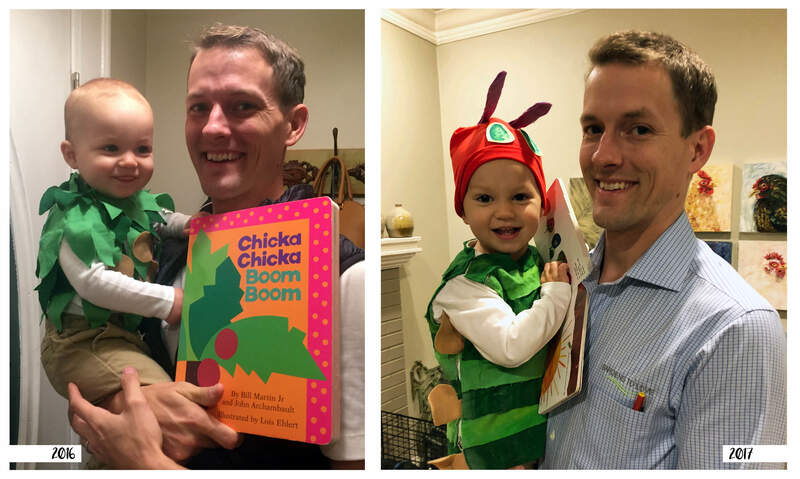 Cooper in his “Chicka Chicka Boom Boom” costume in fall of 2016, almost at a year old, and in his “The Very Hungry Caterpillar” from this year. I can’t believe how much he has grown in a year! 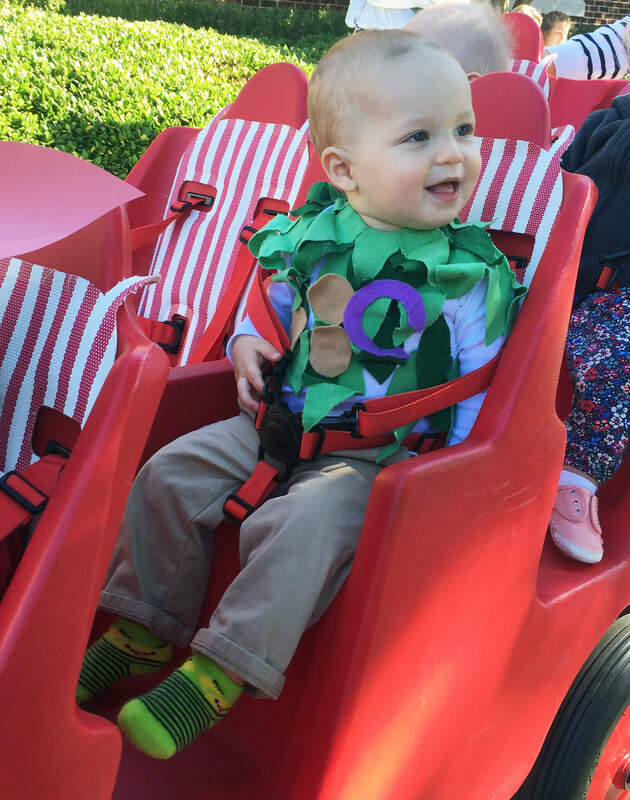 Although these are short term costumes, I love being able to make something for him. My wallet also appreciates it. Thanks for taking the time to check out my latest how to post. Help me spread the word about DIY, crafts, and all things art by sharing with others. Thanks for stopping by!